What data is included in FiberLocator? 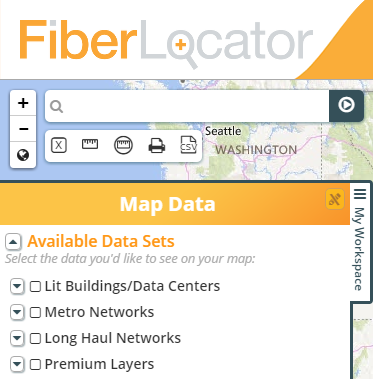 FiberLocator 2.0 provides users with access to our growing database of carriers, lit building records, and data centers, providing the visibility for companies to dynamically design and build smarter networks more efficiently and cost-effectively. 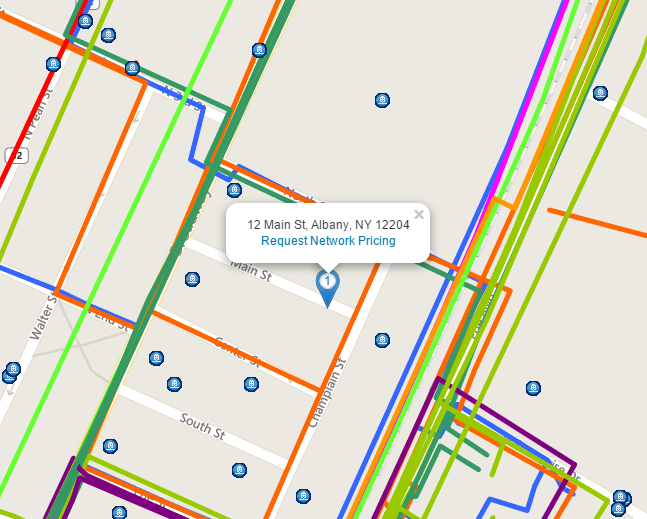 We have fiber maps from service providers of all sizes across the US. There is a brand new layer for premium data sets which will be expanding over time. There may be a charge for specific premium data sets, but this cost is yet to be determined. Our maps and data are detailed to street level and are ideal for sales and pre-qualification activities. For accuracy and security, our system does not offer engineering level. Users can get the required detail for project planning from the carriers identified in FiberLocator. 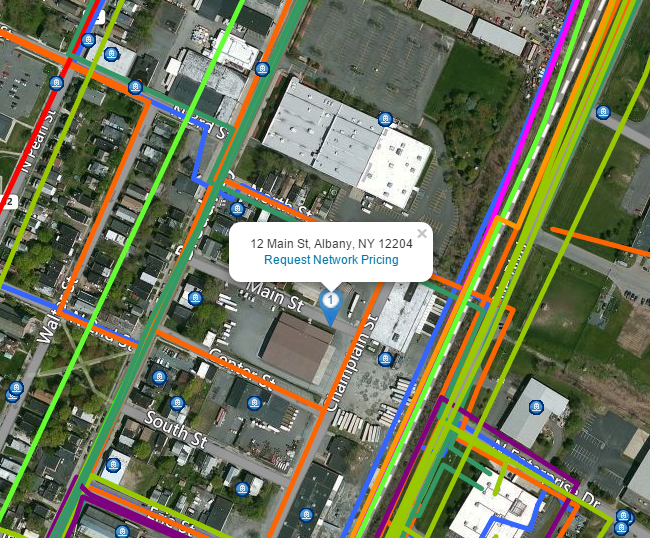 Aside from a street level view showing roads, FiberLocator also offers an aerial view of the map data. Users can toggle between the three available views at any time. How is the data available? We offer a variety of formats for you to choose from to receive and utilize the fiber and lit building data. You can use the SaaS based FiberLocator Online interface, which is available by subscription. You can request a single map view with our Single Snapshot product available on a cost per map basis. The data is also available for integration with your system via an API. What areas are included in your data? FiberLocator covers the 48 contiguous US states. Our growing international data and global dataset of submarine cables and cable landing stations will be located under the Premium layers in FiberLocator 2.0. Can you tell me which carriers are in your database? If you are looking for specific providers, we can let you know if they are currently represented in the tool. However, we do not publish a list of all the carriers in FiberLocator as it is frequently updated and thus is ever-changing. You can schedule a demo of the tool and see for yourself which providers are included. Our data is provided by the carriers that participate in the program. We also accept user submitted data suggestions as well. We update our data weekly and our participating carriers keep us continually updated with their data. Most of the large carriers submit new and updated information quarterly. In addition, we are constantly adding new fiber providers, lit buildings and data centers. If you know of a provider that is NOT currently in FiberLocator, please send us their contact information. I already have a system where I maintain network information. Am I able to integrate that with FiberLocator? 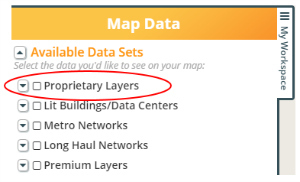 Yes, one of the newest features we’ve added to FiberLocator is the ability to upload your own data into the database under the “Proprietary Layers” section. You can upload any of your own fiber research into the tool including sold circuits, shadow conduit, cell towers, lit building information, and more. This information remains private and viewable only to your account. Customers can submit GIS map files for line data (such as fiber maps) via kmz, kml or shp files, or submit address information for point data (such as lit buildings or data centers) via xls, csv or even doc files. How can I see a demo of the features of FiberLocator and what is the quickest way to get up and running? You can watch our training videos at any time. You can request a live demo session in FiberLocator. You can access our user guide. Do you offer a free trial of FiberLocator? We do! The best way to understand the power of FiberLocator is to see it in action and use it for yourself. To request a free trial, click here. How much does FiberLocator cost? FiberLocator Online subscriptions are priced on a per-user, per-year basis. The cost for one seat license is $3800/year. Additional seat licenses are only $1300/year. If you are with a large organization and need more than 15 users, we offer Enterprise level access and special pricing. Please contact sales@www.fiberlocator.com for pricing. We also offer an application programming interface (API) that allows you to custom integrate continually updated fiber and colocation infrastructure information without storing the data or having to utilize the FiberLocator Online interface. Our API subscriptions have a one-time $5,000 development fee and the annual fee is based on your company revenue. Please contact sales@www.fiberlocator.com for pricing. If you only have a one-time need for our data, our Single Snapshots start at $200 for the first map and $40 for each additional map during the same web session. All Snapshots are customized with a FiberLocator Specialist. See all of our products here. Is there a minimum number of months you have to sign up for? All FiberLocator subscriptions require a 12 month minimum contract. If you have an ongoing need for the information offered in FiberLocator, we offer a 10% discount for 24 month subscriptions and 15% discount for 36 month subscriptions. Can FiberLocator be used for engineering projects or do you offer location services? FiberLocator is a sales tool, not a “dig safe” or engineering tool. We can certainly provide fiber map data at most locations, but the information is for sales “pre-qualification” purposes and is not necessarily engineering grade. Can I see ILEC and local cable companies’ fiber assets? It is rare to get maps from ILECs and MSOs, and as such FiberLocator does not show ILEC/local cable company information on a metro level. Thankfully, FiberLocator does have lit building information for various ILECs as well as some of their long-haul routes. When we do have a building list from the LEC or cable company, we can see their lit buildings among the available providers, and we can deduce that they have the ability to provide service in an area even though we can’t see the physical path of their network. Can you tell me if there is fiber in the community where my house is located? Unfortunately, we only have data for business addresses and not for residential class services. What constitutes one map for your Single Snapshot? The Single Snapshot map would be one PDF or PNG map of a specific address or location you specify. The view can either be street or aerial and both the data layers and zoom radius are selected by you. We typically generate the Single Snapshot while connecting with you through a live joint web session. This way you are able to view and customize the map as it is being generated to ensure you receive the map output you desire. I work for a carrier. How do I get my information to you? 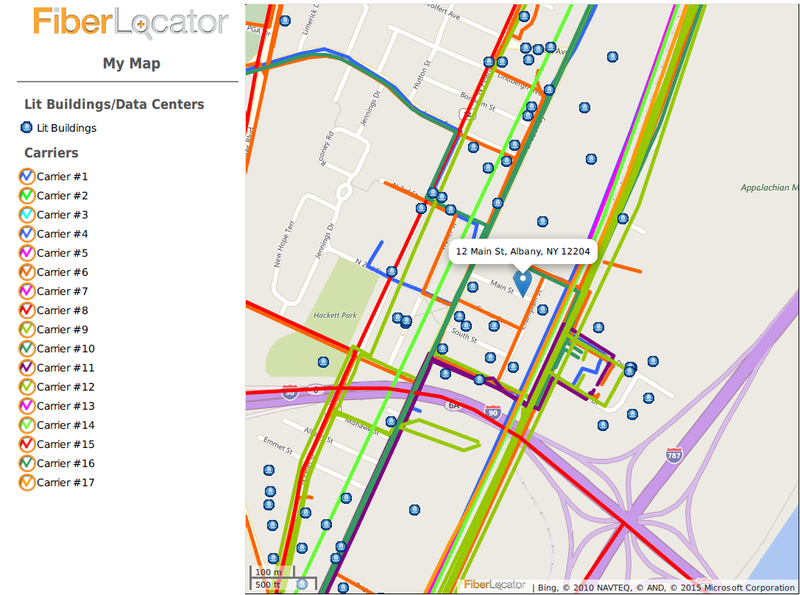 It’s easy to get your maps, lit buildings and data centers in FiberLocator. Please complete the form here and then we will contact you for additional information needed. There is no cost to you. I work for a data center. How can I get my information to you? Simply fill out this form. There is no cost to you. You receive free exposure to well qualified sales opportunities.